Precious metals futures advanced Monday as a group. Gains in gold and silver were more modest compared to the over 2% increases in platinum and palladium. Gold for December delivery tacked on $10.40, or 0.9%, to settle at $1,194.60 an ounce on the Comex division of the New York Mercantile Exchange. "Gold’s overdue a relief rally after last week’s sell off," Adrian Ash, head of research at BullionVault, told MarketWatch. "Bargain-hunting by long-term allocators is also playing a part," he said. Gold futures ranged from a low of $1,189.60 to a high of $1,196.90. They dropped 2.9% last week, marking their biggest weekly decline in more than a year. On Thursday, gold settled at $1,184 an ounce — its worst level since Jan. 6, 2017. Meanwhile, silver for September rose 3.9 cents, or 0.3%, to settle at $14.67 an ounce. Silver futures traded between $14.62 and $14.83. They sank 4.3% last week, registering a year-to-date loss of 14.7%. October platinum surged $16.60, or 2.1%, to $793.90 an ounce, ranging from $786.10 to $797.90. Palladium for September delivery jumped $20.90, or 2.4%, to $898.70 an ounce, trading between $886.30 and $903.50. Last week, platinum tumbled 6.3% and platinum fell 2.6%. Gold rose $5.95, or 0.5%, to 1,184.35 an ounce. Silver added 9.5 cents, or 0.7%, to $14.755 an ounce. 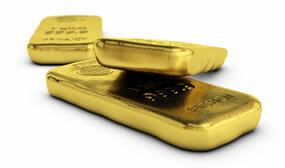 In LBMA results last week, prices declined 3% for gold, 4.7% for silver, 5.9% for platinum, and 1.8% for palladium.